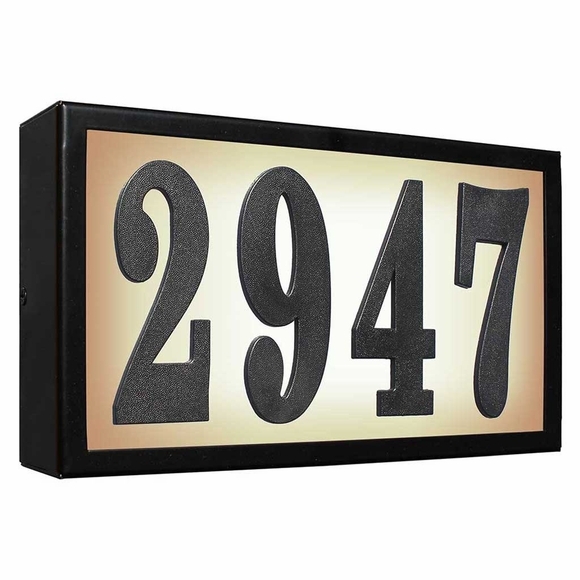 Low Voltage Lighted Address Plaque with easy to apply DIY black polymer numbers. Custom lighted address plaque at an affordable price. You save money by applying the numbers yourself. FAVORITE COMFORT FEATURE: Do It Yourself customization is an economical option when shopping for a lighted address plaque. Holds up to four (4) 4" black polymer numbers (included) that need to be glued to the lens. Features a galvanized steel frame with a tough black or bronze powder coat finish. The large image shows a black frame and incandescent backlight. The first three small image styles (from left to right): black frame with LED backlight, bronze frame with incandescent backlight, and bronze frame with LED backlight. Dimensions: 10.5"W x 5.5"H	x 2"; weighs 3 pounds. Note 2: If your address has more than two of any number, please provide the complete house number in the comments section of the order form so that we can request the additional polymer number(s) for you.